DisplayPort is a new digital display interface standard put forth by the Video Electronics Standards Association (VESA). It defines a digital audio/video interconnect intended to be used between computer and display monitors, or computers and home theater systems. Similar to HDMI, in that it supports both Digital Video/Audio signals, DisplayPort is geared more toward the computer market, where HDMI dominates the Home Theater market. Tripp Lite's DisplayPort cables support a maximum bandwidth of 10.8Gbps, as well as DPCP (DisplayPort Content Protection), HDCP, and Ultra High Definition (UHD) 4K x 2K video resolutions up to 3840 x 2160, including 1080p. 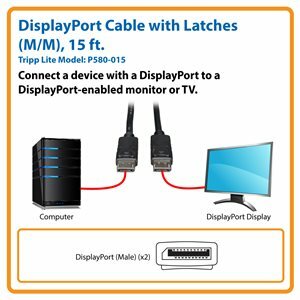 The Tripp Lite P580-015 DisplayPort Cable (M/M) is ideal for digital signage, video presentations, point-of-sale displays, classrooms and other applications that display high-resolution video and multi-channel audio. It connects DisplayPort-enabled computers and laptops to DisplayPort-enabled displays, such as monitors, projectors and high-definition TVs. This 15-foot cable supports monitor resolutions up to 2560 x 1600 @ 60Hz and 1920 x 1200 @ 120Hz, including 1080p. For higher resolutions, including Ultra High Definition, we recommend using Tripp Lite’s B121-000 signal booster. The P580-015 also supports transfer rates up to 10.8 Gbps, HDCP, DPCP and DisplayPort v1.2. High-quality latching connectors click into place to ensure optimal signal transfer and that the connection won’t accidentally come loose. The molded cable features premium foil and braid shielding to deliver top-of-the-line signal quality and protection from EMI/RFI interference. A flexible PVC jacket makes the P580-015 easy to install in tight spaces. The P580-015 comes with a lifetime warranty. It’s manufactured in compliance with strict RoHS specifications, reflecting Tripp Lite’s commitment to environmental responsibility. P580-015 DisplayPort Cable with Latches (M/M), 15 ft.